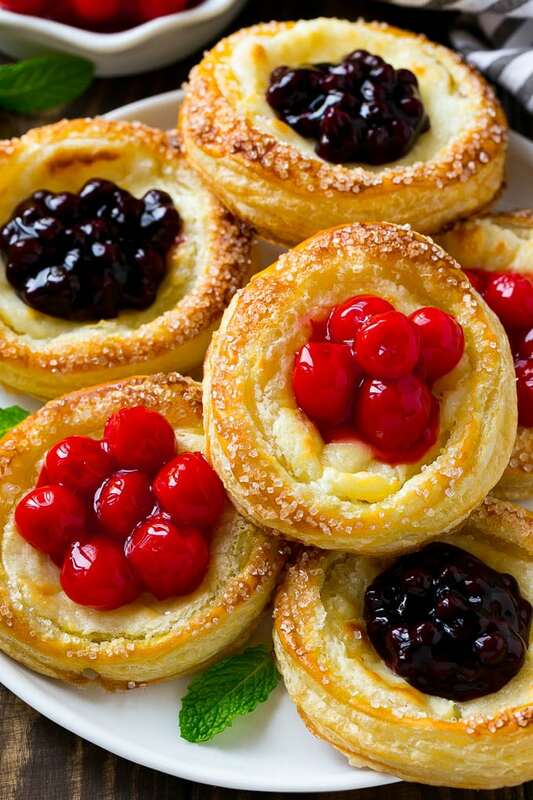 These cream cheese danish are a light and flaky pastry topped with a sweet cream cheese filling and fruit. An easy yet elegant breakfast option! I love a good cheese danish, it’s definitely one of my weaknesses when it comes to breakfast pastries! These cream cheese danishes are quick to make and taste so much better than the grocery store variety! I tend to be more of a savory breakfast person, but the one morning sweet I can’t resist is cream cheese danish. That buttery pastry and cheesecake style filling get me every time! Making cream cheese danish at home is actually quite easy and is an impressive addition to any breakfast or brunch. 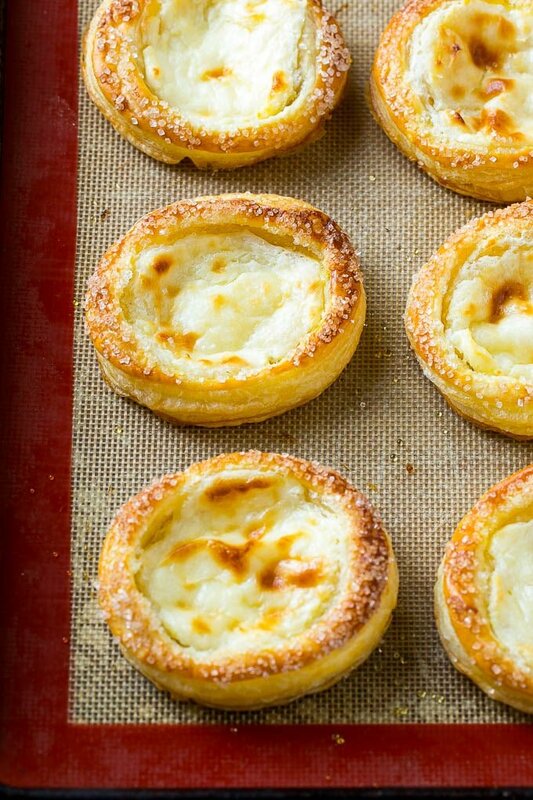 The trick to easy cream cheese danish is a box of frozen puff pastry. It performs in a similar way as a homemade danish dough would, and is so very convenient to use. 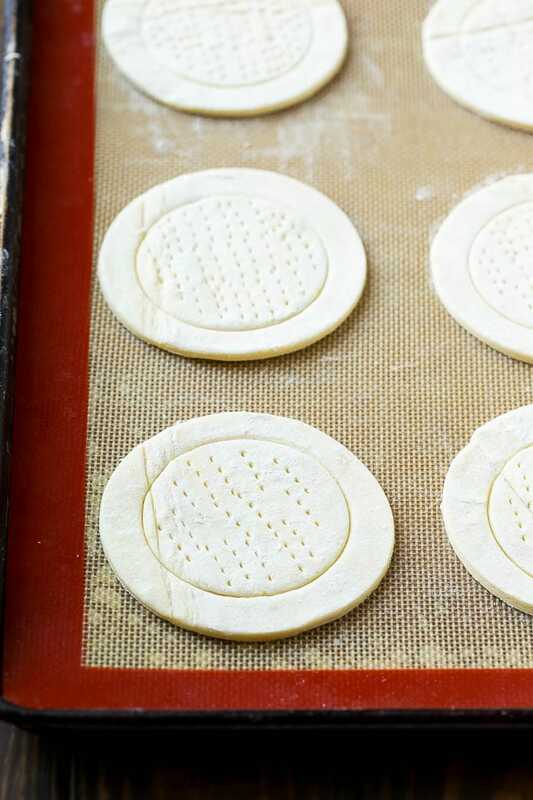 The first step in the process is to cut your pastry into rounds. You can use a 4 inch cookie cutter or the rim of a drinking glass. You’ll want to also use a small knife or smaller cookie cutter to score a circle around the interior, which will create the pastry border for your danish. Pricking the interior pastry with a fork will help to keep it from puffing up too much since that’s where the filling goes. The filling is a sweetened cream cheese that gets spread into the centers of the pastry rounds. The pastry is brushed with egg wash to give it a golden brown shine, and a little coarse sugar goes around the edges for added sweetness and texture. After the pastries take a quick trip through the oven, you’ll be rewarded with amazingly delicious cream cheese danish! You can absolutely serve these danish as-is, but I love to put a spoonful of pie filling or fresh fruit in the center. Here I used both blueberry and cherry pie fillings, you could also use apple or strawberry, or add some fresh berries on top. 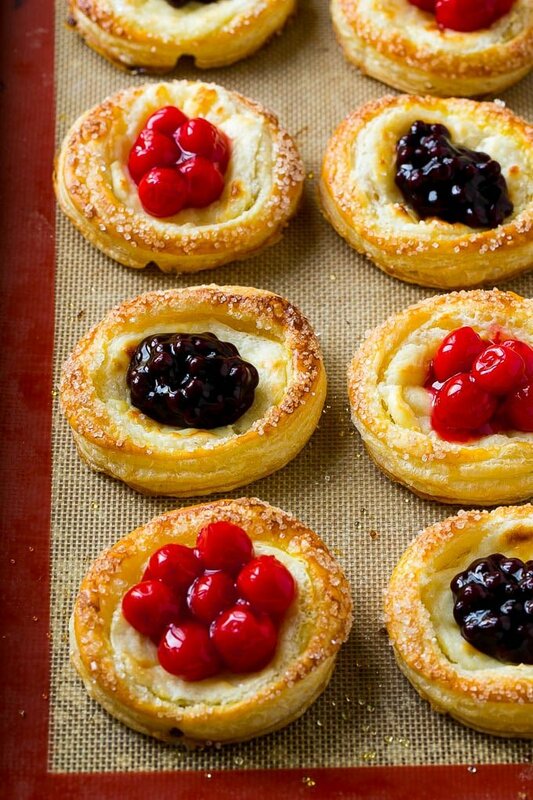 Everyone will think you bought these cream cheese danish at a fancy bakery! They taste WAY better than your typical supermarket danish, and I love how easy it is to customize your flavors. I love making these easy breakfast pastries to serve for the holidays too, they’re great on Christmas morning or for Easter brunch. I always keep a box of puff pastry in my freezer for when the mood strikes! Place the puff pastry sheets on a non stick surface such as parchment paper or a baking mat. 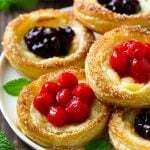 Use a 4 inch round cookie cutter or drinking glass rim to cut 4 circles out of each sheet of pastry. See recipe notes for ideas on what to do with leftover pastry scraps! 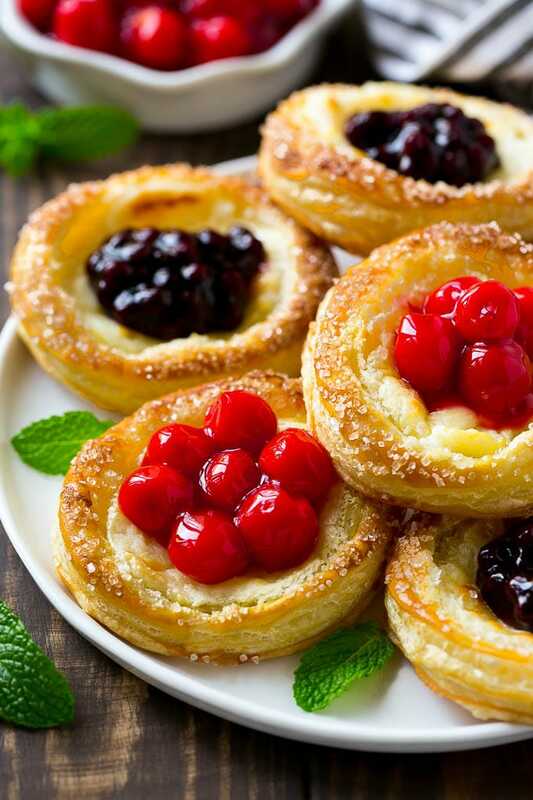 Using a small knife or a smaller cookie cutter, score a circle about 1/2 inch in from the edges of the pastry rounds. Use a fork to prick all over inside the smaller circle. Place the cream cheese, sugar and vanilla extract in the bowl of a mixer. Beat until smooth and creamy. 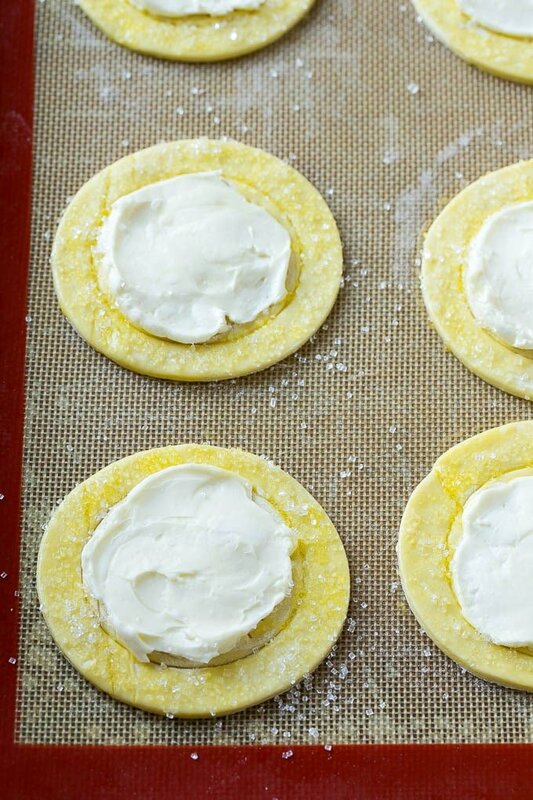 Gently spread the cream cheese filling inside the smaller circle of each pastry round. Brush the edges of the pastries with beaten egg and sprinkle with coarse sugar. Bake for 17-20 minutes or until edges are golden brown. Cool, then spoon 1 tablespoon of pie filling into the center of each pastry. Serve. Don't throw away your puff pastry scraps! Brush the scraps with a little melted butter, then sprinkle on the seasonings of your choice and a some finely grated cheese. Twist the pastry into breadsticks and bake at 400 degrees F for 8-10 minutes or until golden brown. You can do that, I’d recommend adding the fruit topping just before serving! I’ve made these now a few times changing up the fruit I use each time. Easy and always comes out perfect! I was wanting to make the dough on Christmas Eve, Would it be possible to refrigerate the dough overnight and bake it in the morning on Christmas? Have made these twice now and I’m amazed at how easy these are to make. They are definitely better than store bought danish. My grandkids love them. Thanks so much for sharing this recipe. 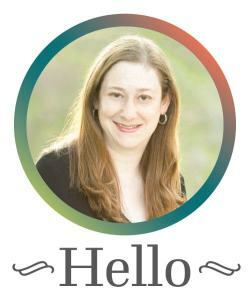 So glad to hear you enjoyed them, thanks for reporting back!